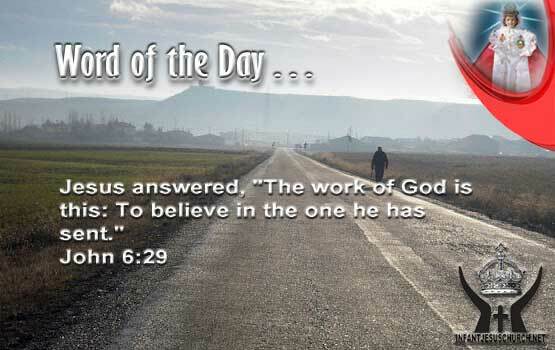 John 6:29: Jesus answered, "The work of God is this: To believe in the one he has sent. Heavenly Father, we do believe that Jesus came to earth, died, and was raised from the dead. Please help us show and share that message with those around us looking to find hope and help. Lord, we want so much to share in your work; please help us as we offer myself to it today. In the name of Infant Jesus my Savior we pray. Amen. No one can be unresponsive with Jesus for long. What he said and did - his signs and wonders, he did in the name of Holy God. Jesus not only asserted to be the Messiah, God’s Anointed One. He claimed to be in a exceptional relationship with God and to know him as no one else did. The religious authorities did all they could to put a stop to Jesus because they could not believe his declare and the demands he made. We cannot be indifferent to the claims which Jesus makes on us.